Summary: Ever since he was little, Alex has been in love with horses. Without the funds to own one himself, Alex pretends his bike is a horse, until one day his dreams come true and his father wins Turnip in a poker game. Thus Alex’s life as a cowboy begins as he learns to ride Western style. But what interests Alex most is dressage, an aspect of English riding. Unfortunately this does not fit in with Alex’s father’s idea of what a cowboy should be, and Alex must chose between following his dreams and being who he really is or pleasing his dad. With the help and support of Cleo, a new friend from a nearby equestrian boarding school with issues of her own, Alex finds the strength to stand up for himself and do what he was born to do. Review: Full of colourful characters, Another Kind of Cowboy by Susan Juby is a story about friendship, family, and following your dreams. This is the fourth Juby novel I’ve read and once again she brings her trademark humour to her writing with deeply funny moments and characters. At the heart of Alex’s story is the age-old struggle to find the courage to do what you want to do and be who you are, even when you know others probably won’t understand or support you. Not only does Alex go from Western to English riding, he also comes out as gay to his family to mixed results. Driven by wanting to do Dressage so much Alex tends to neglect the social aspects of his life, Cleo seems to help him with that and by the end he has the support he was lacking. Cleo, however, is a different story. She seems to keep walking into the same trap, building so-called friendships with people who just want to use her, probably because she is starved for attention thanks to her neglectful parents. I mostly felt Cleo’s actions were misguided as opposed to malicious, but where Cleo helps Alex open up and take risks by letting people in, Alex shows her that not all people will use her, and that some do genuinely care about her. I love the theme of belonging that runs through some of Juby’s books. By the end of the book a pretty rag-tag group of friends exists for both Alex and Cleo, but they’re more than friends, they are family. I was struck by Juby’s descriptions of the various styles of riding as well as the different horses themselves. She really showed me that horses behave uniquely depending on who is riding them, because they are incredible creatures with personalities and preferences all their own. I wanted to cry when Detroit went back to his owner, because it was clear Alex’s skills were a gift and that he loved all of the horses he rode. I also loved Juby’s contrast between those who ride to appear rich and well-bred to those who ride because they have skill and passion. Living vicariously through Alex and Cleo as they rode their horses was wondrous, and I appreciated the vibrant picture Juby created for me. “After making a series of illegal turns, Cleo got onto the highway. Traffic was heavy and moving slowly. At least, most of it was. The Volkswagon Passat swerved in and out of the fast lane, darting around slower-moving vehicles like a bionic rabbit in a field of three-legged tortoises. ‘Hey, Sam, has this thing got air bags?’ asked Cleo after an excruciatingly close call with a panel van. ‘Yes!’ shouted Alex from the backseat. When Cleo screeched to a stop in the dealership lot, Sam practically leaped out of the passenger seat. Cleo turned back to Alex with one of her eyebrows raised. “It seemed to Alex that he could feel the horse’s back muscles ripple in time with the music as they crossed the diagonal at a medium trot. Detroit did a traverse to the right and then to the left at the trot, maintaining his rhythm. When Alex tightened his stomach. Detroit stopped in time with the crescendo. The horse backed up the four steps at the slightest prompt and then moved off again. Alex put the big gelding into a canter, again perfectly timed to the music. He lengthened and collected the horse’s canter, then let him stretch his neck down to take the bit. Alex felt as if he’d grown wings and that his horse was stepping on clouds rather than sand. The music swirled around them and Alex heard the crowd clapping in time. He put the horse into a medium trot and the clapping seemed to hold them aloft each stride for an extra moment. 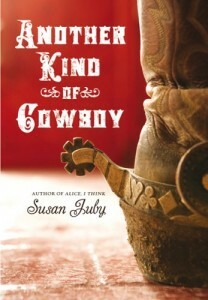 Another Kind of Cowboy by Susan Juby is published by HarperTrophy Canada, (2007).